We wash our clothes to keep them clean after we wear them; so why are glasses any different? Natural salts and oils in your skin can have a negative impact on your glasses if you don’t keep them tip-top, especially if they’re worn through action-packed sports hobbies or nearly demolished by the kids. That’s why we’ve decided to give you a word of advice, or two, to ensure any new glasses you’ve purchased from us stay looking that way. It doesn’t take a rocket scientist to see the benefits of locking away your glasses in a hard case when you’re not wearing them – who knows what can happen on the daily commute when somebody on the train accidentally sits on your bag and on your glasses. As well as protecting against damage, a hard case can keep your specs free from dust and dirt. Most of our glasses are, in any event, supplied with a hard case so we’ve got your frames covered, but if you’ve misplaced your case or simply want a new one – we do have a selection available with prices ranging from budget to designer. Click here to have a look. Many of our glasses also include a microfibre cleaning cloth which is vital to keeping your glasses clean. You should try to avoid using your clothes or hanky as both attract dust, even if you can’t see it. Microfibre is specifically designed to retain dirt and absorb liquids and so are perfect for cleaning (that’s what they’re designed for!) Although these are easily lost it’s a good thing we sell back-ups through the Accessories section of our website. It’s recommended to get a large cloth, but we also have a pack of 5 multi-coloured cloths too which have received 5 star ratings from our customer’s reviews. Follow this link browse our accessories. As well as good value cloths we also sell cleaning solutions suitable for most frames and lens types. However, if it’s your Oakley sunglasses you’re looking to spruce up a bit then check the aerosol spray first – if the spray suggests it is harmful or flammable it could cause problems for the O-Matter material that Oakley frames are made form (hence the expense). If in doubt, an alternative is to use clean water and then dry thoroughly. Cleaning solutions are also available through our accessories section of the website. 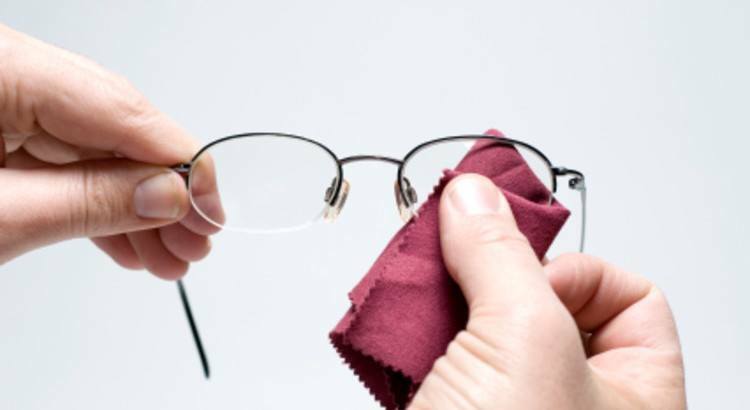 Another tip for owners of rimless glasses is to take extra care when cleaning by not holding the frames, because this can loosen the lenses over time, so instead hold the edges of the lenses when doing so. Loose frames and/or lenses can always be tighten up with tools, which are available here, or by your local opticians who may charge a small fee. Nose pads worn down a bit? They too can be easily (and cheaply) replaced. Take a look at our nose pads here. Of course some of us may be the most cautious beings when it comes to looking after our glasses but mistakes can happen, or if your prescription has changed and you want to keep your frames then we have a re-glaze and lens replacement service. Click here to find out more. If you’re located near to our store in Westgate on Sea (in Kent UK) you can always pop in for a chat about cleaning tips or advice and we’d be happy to make any frame adjustments required. My sister has had glasses for most of her life. She often uses her shirt to clean them. Your advice to avoid using clothing is new to me. I didn’t realize that clothes attract dust and aren’t a good way to clean glasses. I’ll be sure to let her know so she can try another method. I absolutely love my sunglasses but I always seem to lose them. I have been wanting some Lura glasses for a while now and I don’t want to lose those or damage them. When I get those I will definitely follow these tips and do my best to take care of them. Thanks for the wonderful advice! I agree with what you said about cleaning material. I used to get frustrated about how fast my glasses get dirty. After I got new cloth for them, they stopped getting dirty so fast and were a lot easier to clean.